“Believe it or not, the world of the past was much more violent than our world today. Violence has been in decline for thousands of years and today we may be living in the most PEACEFUL era in the existence of our species.” Dr. Steven Pinker, cognitive neuroscientist and Professor of Psychology, Harvard College, and twice nominee for the Pulitzer Prize, scientifically demonstrates through data sets and graphs that this is a fact. 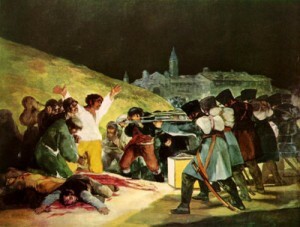 One of the most treasured paintings in the Prado Museum in Madrid, Spain is the artist de Goya’s terribly beautiful painting, “The Third of May.” The canvas shows the cruelty of Napoleon’s armies during the occupation of Spain in 1808. 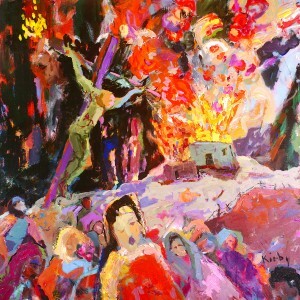 Each figure in the painting presents a different emotion when facing death. We are haunted daily by appalling images of violence and genocide in the media. Is violence really declining in our world? Listen to Dr. Pinker prove his point. Click here if unable to view the video. I believe that violence really is on the decline, but that our drama-based pandemic media rampages perception to the point of insensibility. When you factor in economic, emotional and psychological violence — I don’t think so. maybe these forms of violence are on the wane also but how to document??? OH MY !!! I have never seen you paint violence. Kirby. Interesting topic/comparison. Not familiar with the authority you site. But, isn’t it difficult to believe we are living in a “peaceful” time? Of course, we only know we read, watch, and fuss about – the result of being “informed” by media. Could we not be approaching a high point in world wide chaos, calamity, and pain, i.e., the near east shuffle board, China, Iran, north africa, economic depression, U.S. military adventure, President Obama , and other issues that do not translate into peace? But once again, I pray that you and the Harvard professor are correct. Love de Goya. Incidentaly, Napoleon Bonaparte, a French national, was actually a Corsican Italian. Not very surprising that one of the most peaceful, positive,and creatively smart persons would be reading this material. Thanks for bringing this to me. Love YA Dahlin!!!! Can’t argue with the doctor, right? :) Seems like globalization has its’ upsides, afterall. Dictators and genocides are clearly under a microscope and God-willing, on their way toward an end. Pinkerton has some remarkable books on why is there language? And I know he does have some jazzy jesting about human persistance, which is his idea of peace time jive! Or not? I think the “threat of war” during the Cold War kept things somewhat calmer, but since the turn of the 21st century, it seems the “threat” is less of a deterrent. We are facing “localized” violence that is the result of the increasing lack of civility evident in our cities, neighborhoods, and schools, cell phone videos of violence spread instantaneously , and a growing lack of self-control. Artists and authors have and continue to hold up Humanity’s Mirror to reflect what’s happening in the world, and, hopefully, the images continue to cause change. Very thoughtful comment! I will ponder this for awhile. I tremble at some of the images us artists are presenting in Humanity’s Mirror today. I have read some just right stuff here. Certainly worth bookmarking for revisiting. I wonder how so much effort you place to create this type of wonderful informative website. obviously like your website but you need to test the spelling on several of your posts. Several of them are rife with spelling issues and I in finding it very troublesome to inform the reality on the other hand IÂ¡Â¦ll definitely come back again.